On the 21st April 2016, H.M Queen Elizabeth II celebrated her 90th birthday. To commemorate this majestic milestone, a new portrait of Her Majesty was issued. Approved by Buckingham Palace and layered in pure gold, the Queen’s 90th Birthday Coin has become one of the most significant coin issues of 2016, and it can be yours today for FREE - just pay postage of £2.50. 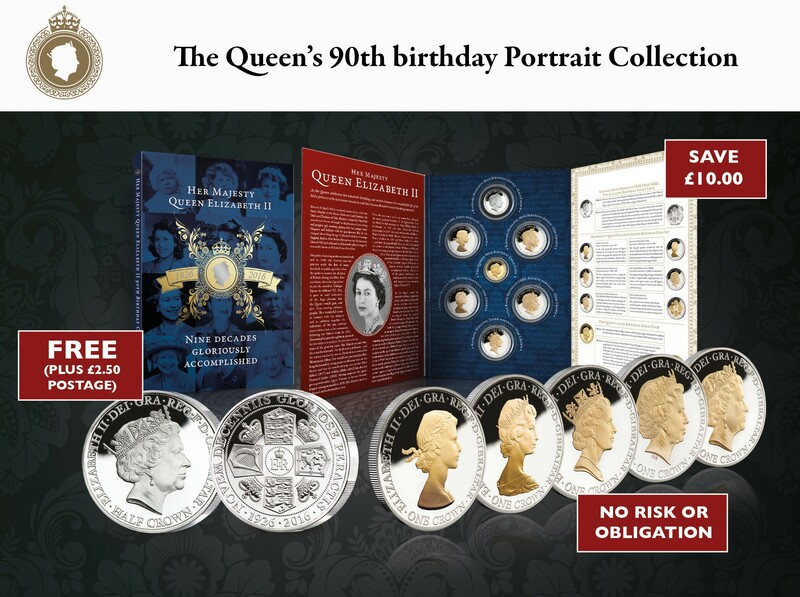 Please send me the Her Majesty’s 90th Birthday Portrait Coin for FREE (plus £2.50 postage). If I choose to keep the coin, I will receive the remaining five coins in the Queen Elizabeth II 90th Birthday Coin Set in convenient monthly intervals. There is no risk or obligation and I can stop receiving at any time. The first coin in the set Mary Gillick, First portrait will be just £19.95 (plus £2.95 P&P), saving £10.00 with this offer. The remaining four will be £29.95 (plus £2.95 P&P) each. There is a strict limitation of one per household. I am 18 years or over. View each coin before you decide to add it to your collection.